Quinney proved an engaging and informative lecturer, and illustrated his points with excerpts at the piano including one of the fugues for pedal piano, and concluded the lecture with a performance of the Allemande from Bach's Fourth Partita. 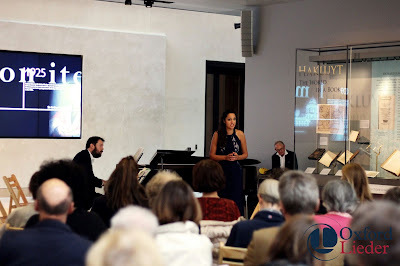 In the afternoon, in the lecture room of the Weston Library, Hannah French gave an illustrated lecture on the involvement of Mendelssohn, Sterndale Bennett and Schumann in the revivals of the Bach St Matthew Passion. This of course started with Mendelssohn's famous performance of the passion in 1829. Mendelssohn and his sister were members of the Berlin Singakademie, a group which used to explore old music. And the director of the group, Carl Friedrich Zelter, had a copy of the score of the St Matthew Passion but Zelter failed to put on a performance of the passion, feeling it was not possible. The teenage Mendelssohn clearly had great enthusiasm for the passion, he was given a copy of the score as a present. Encouraged by the actor Eduard Devrient (who wanted to play the role of Christus), and allowed to use the Berlin Singakademie by Zelter, Mendelssohn performed the passion in 1829. 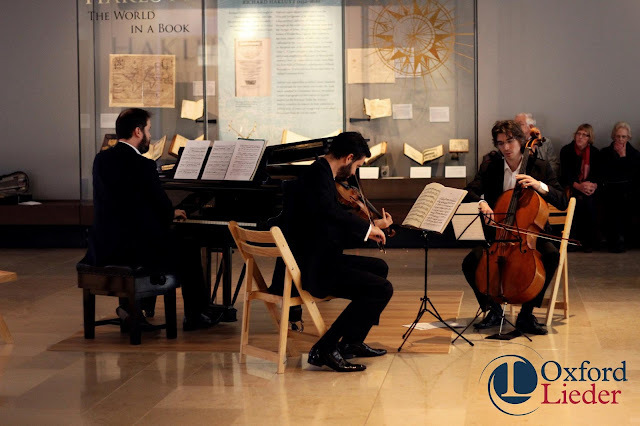 Some 60 minutes of the music were cut to make the performance do-able, and the recitatives were performed by two cellos (double stopping) and a double bass, the oboes d'amore and da caccia were replaced by clarinets. There was a year of rehearsals, and the orchestra included a mixture of amateurs and professionals. The parts and the score are in the Bodleian and it is clear that it was a very dramatic performance, there are lots of dynamic markings in the score, lots of pianissimos. Sterndale Bennett, whom Mendelssohn invited to Leipzig, was clearly influenced by this Bach enthusiasm and in the 1840s he put on performances of the music of Bach in London and in 1849 he set up the Bach Society in 1849 with the aim of collecting the works of Bach. The society performed the St Matthew Passion in 1854, the first performance in English, and movements from the Mass in B minor in 1860. French showed parts of Bennett's score for the passion, again highly marked up with dynamics and cut as per Mendelssohn's performances. Though the society gave further performances of the passion, Bach's music was still perceived by many as being too difficult to listen to, but Sterndale Bennett persisted. Schumann may have heard Mendelssohn's 1829 performance of the passion, he certainly heard a lot about it and was present at the 1841 performance in Leipzig. In 1851 Schumann formed his own concert society and put on a performance of the St John Passion in Dusseldorf. Schumann got the orchestra parts from the cantor at Bach's old church, St Thomas's Church in Leipzig. He used a string quartet for the recitatives, and had a choir of around 180 to 200 singers. These performances did not lead to a big revival, it was a slow and steady progress. But Schumann's enthusiasm for a publicly available collection of Bach's music would help establish the Bach Gesellschaft in 1850 and between 1851 and 1900 this published 46 volumes of Bach's music. Publication led to further performances and by the time of founding of the German empire in the 1870s Bach is acknowledged to be a great historical figure. But it would not be until 1907 that a complete performance of Bach's St Matthew Passion would be heard without any of the cuts introduced by Mendelssohn, conducted by Felix Mottl in Karlsruhe. French was a lively and engaging lecturer, and as well as visual illustrations we heard excerpts from recordings of the music, providing a window into a very different sound-world. 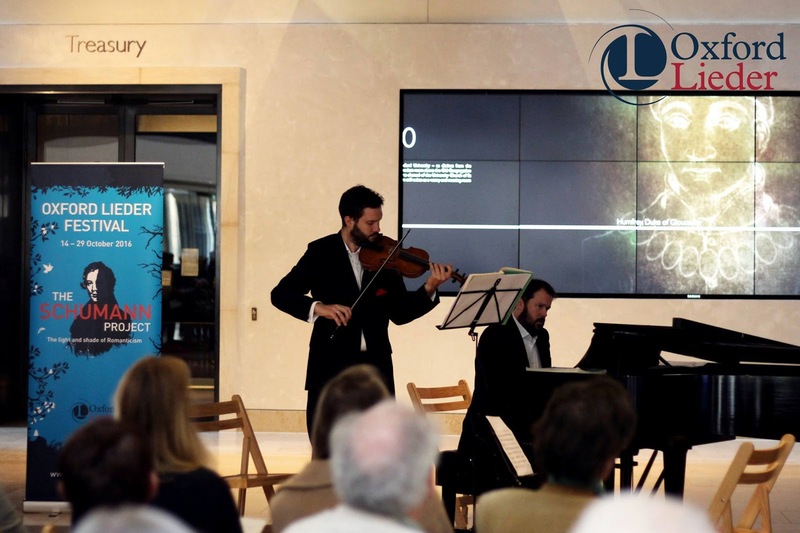 Before the final lecture, there was a pop-up recital in the foyer of the library, so that the music was accompanied by the clink of cups and the hiss of the coffee machine. The soprano Turiya Haudenhusye (who had taken part in the 2015 mastercourse at the festival) sang a group of songs from Bach's Anna Magdalene Notebook and songs from Schumann's Eichendorff Liederkreis. But first we heard the first of Schumann's Sech studien in kanonischer Form written originally for player piano, and played by the Phoenix Piano Trio in an arrangement by Schumann's friend Theodor Kirchner. This really was Bach and Schumann entwined, and made me want to hear the works on a real pedal piano (there are recordings). The three songs by Bach, Bist du bei mir, Willst du dein Herz mir schenken and So oft ich meine Tobackspfeife were accompanied by Sholto Kynoch (piano) and Christian Elliot (cello). Turiya Haudenhusye has a rich toned voice, and brought out the charm and character of the songs in a performance which was no quite romantic but was not historically informed either, thus bringing us a little closer to how Schumann would have heard this music. Haudenhusye and Kynoch also performed three Schumann songs, Die Stille, Wehmut and Zwielicht from the Op.39 Liederkreis, whetting our appetite for Richard Wigmore's talk about the songs. Perhaps the most intriguing part of the recital was the performance by violinist Jonathan Stone accompanied by Sholto Kynoch, of the Andante from Bach's Violin Sonata No. 3 with a piano accompaniment by Schumann, and the Prelude from Violin Partita No. 3 with a piano accompaniment by Mendelssohn. Schumann's accompaniment to the sonata was mainly discreet chords, giving the work a more romantic flavour. Mendelssohn accompanied the partita with music in a more contrapuntal style. Richard Wigmore in his lecture talked about Schumann's songs and how the influence of Bach can be traced. The results were quite surprising, as we heard familiar songs but in a new way. 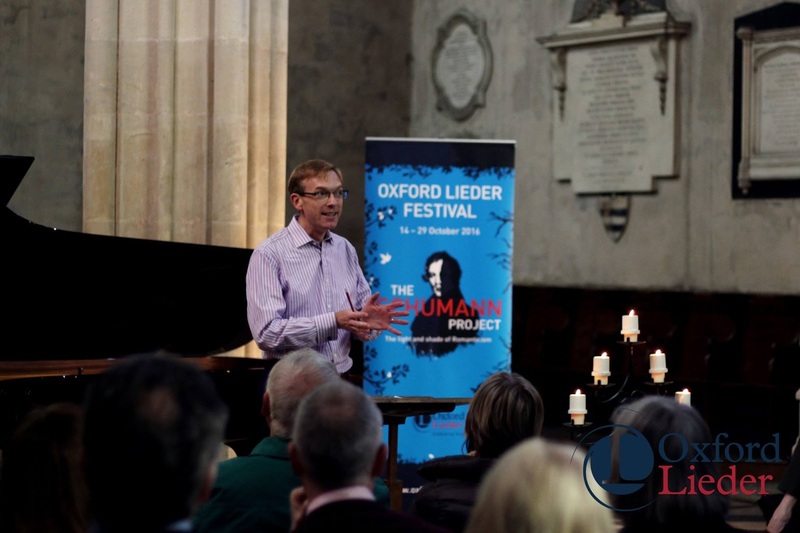 And Wigmore took us through a number of songs from the 1840s and 1850s, from the Heine Liederkreis to the Mary Stuart songs, where Bach's influence can be found, illustrating them with visuals and with recordings. There was one final element to the Bach strand which I had to miss. The final concert of the day, at 10pm in New College Chapel, combined performances of Bach cantatas by Oxford Bach Soloists, with James Gilchrist (tenor), conducted by Tom Hammond-Davies, with two of Schumann's fugues played by Robert Quinney.